We will be honest, winter around Pixie Project mostly consists of snuggling by fires with Chihuahuas or cuddling three quilts deep on a heated mattress pad with dopey, short-haired Pit mixes- there is not a lot of running in the freezing rain and chill winds! Well, summer is almost here and we are looking forward to days of hiking, walking, kayaking and camping, but we don’t want to be out of breath doing it! 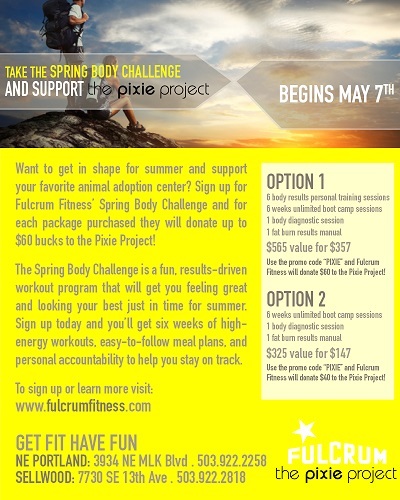 Luckily we have partnered with Fulcrum Fitness to get us in shape and ready for activity! Whether your summer plans have you hiking Oregon’s toughest trails or strolling leisurely on the beach, Fulcrum Fitness will give you a jump start (literally we’re sure)! Best of all, you will be supporting all the pooches and kitties at Pixie! Check out their website HERE for more information!